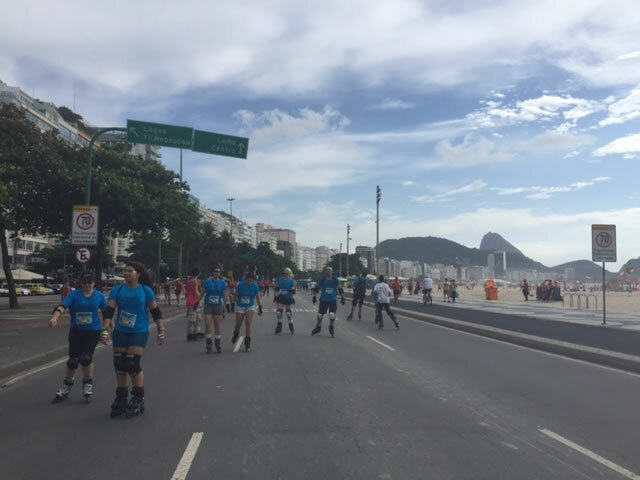 This is Roller Rio’s 5th year in existence and this year’s 8km route along the epic Copacabana beach (and back) was attended by skaters from all over Brazil. 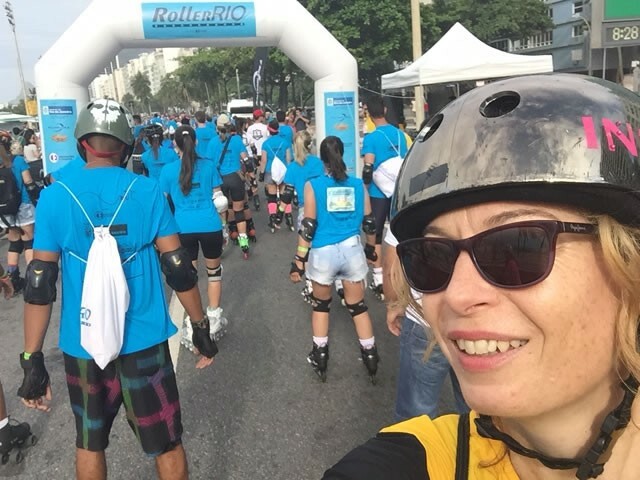 I met skaters form Sao Paulo, Manuas, Salvador, Belo Horizonte, Florianopolis, Petropolis, Goanias, Brazilia, Natal and Rio de Janeiro ….to name a few! In Europe we travel to other cities like Le Mans, Berlin, Barcelona for skating pleasure. 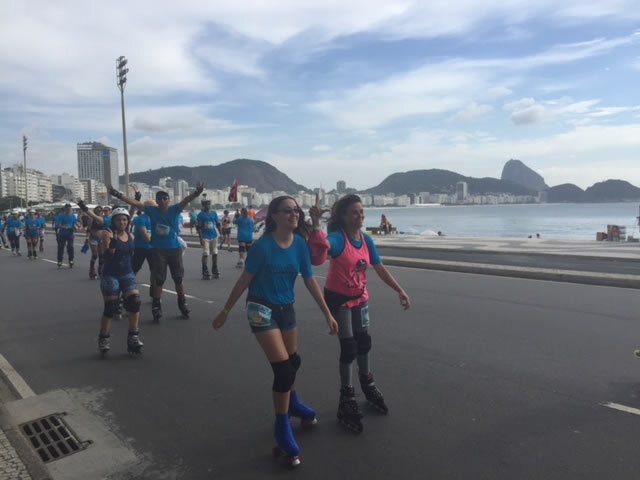 Here Roller Rio is THE destination! 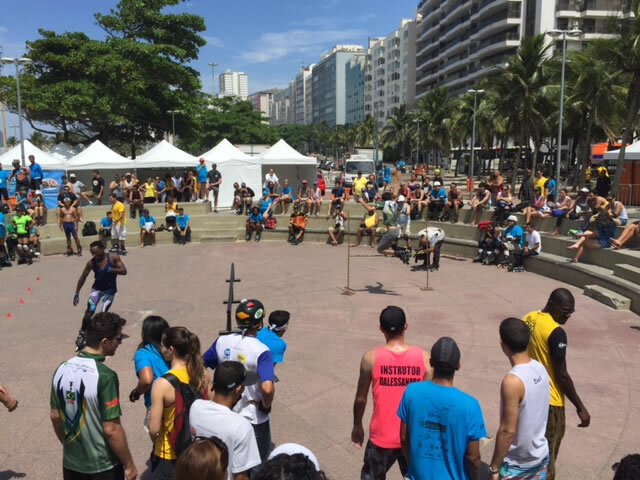 This event is a fun, relaxed street skate along one of the worlds most iconic beaches. 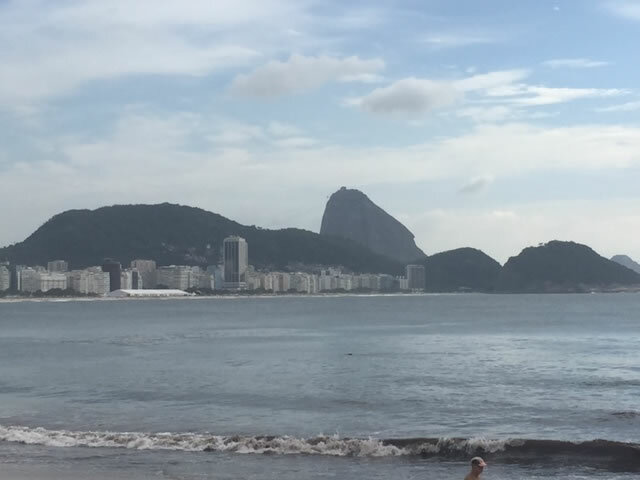 Copacabana is a stunning setting. After the skate there were demonstrations of some skating disciplines; speed, slalom, aggressive, high jump. Rodrigo Morgado and his team of slalomers fresh from the world championships in Turin Italy, gave a spectacular show of skills. 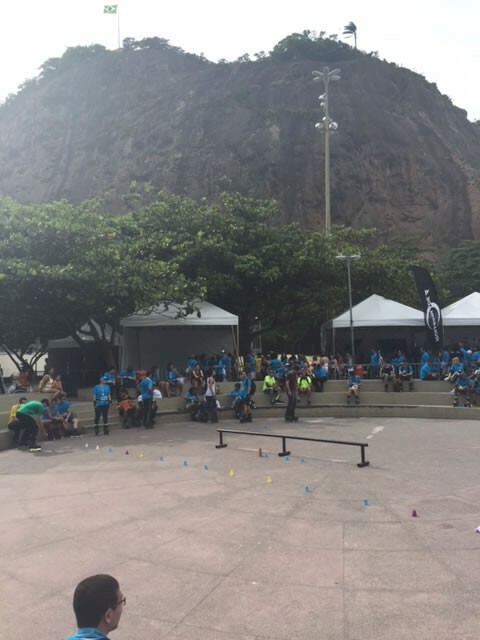 Brazil’s’s best are skating well! Erika Cordeiro (ICP Level 2 instructor) gave a superb dance class of 4 linked sequences. I watched in interest as the crowd of students ‘got it’ incredibly quickly. These Brazilians come to skate dance already KNOWING how to dance, and with Erika’s clear direction the result was large number of people in sequence and in time to the music! I taught the static Toe/Heel spin until dizziness dictated another move. We learned the ‘Zig Zag’ dance move which then became the Toe/Heel Transitions from forwards Scissor to Backwards Scissor. Keeping the upper body still was THE instruction which I noticed made an almost instant improvement in many. The hardest part of the lesson for me was talking into a microphone which only worked if it was touching my lips. Very weird. I think I had my photo taken by more people today than any day ever. Everyone I met was polite and happy and grateful for my work. I am amazed how many said “I learned to skate with you, thank you”. I am so happy that my online lessons are actually helping people. That’s what I wanted. Thank you to Paula Tebett who with her team created a wonderful event. 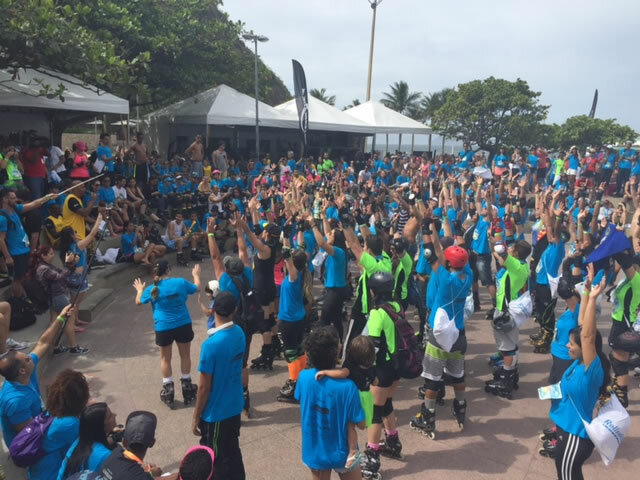 Every place I travel to for skate events I always meet the incredibly people who voluntarily donate their time and energy so that we can all go somewhere and enjoy our sport en mass in some way. I am so grateful to all those people and for the grown it creates in our sport. I’m going to rest now, put my feet up and prepare for 2 weeks of workshops in Sao Paulo with classes starting this Weds 4th Nov. For full workshop details see Facebook page ‘Asha in Sao Paulo’. 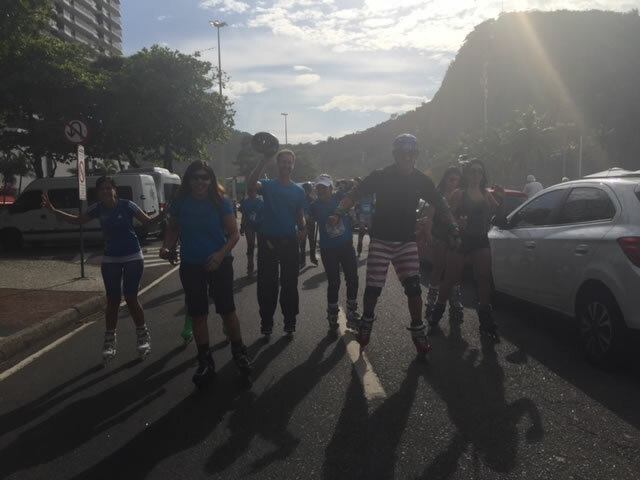 After Sao Paulo I will be hanging up my skates and taking 6-8 weeks off skating in order to heal my still injured hip. 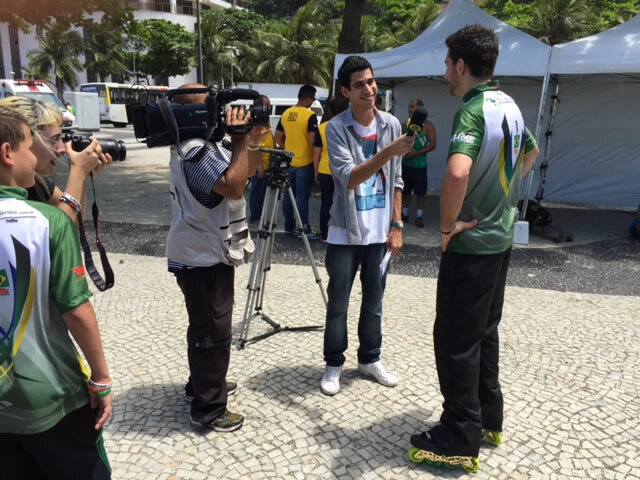 I injured it here in Rio end of January and it has remained aggravated by my fairly constant skating life. 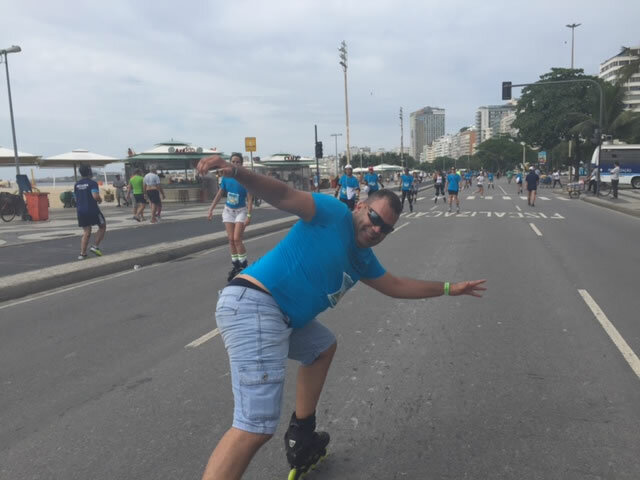 It will be hard to be in Rio and not skate for pleasure. This is where I put my headphones on and skate to the setting sun! But I need to heal my hip so that next year I can do all the fun things I have planned. There’s no better place than Rio to get well. 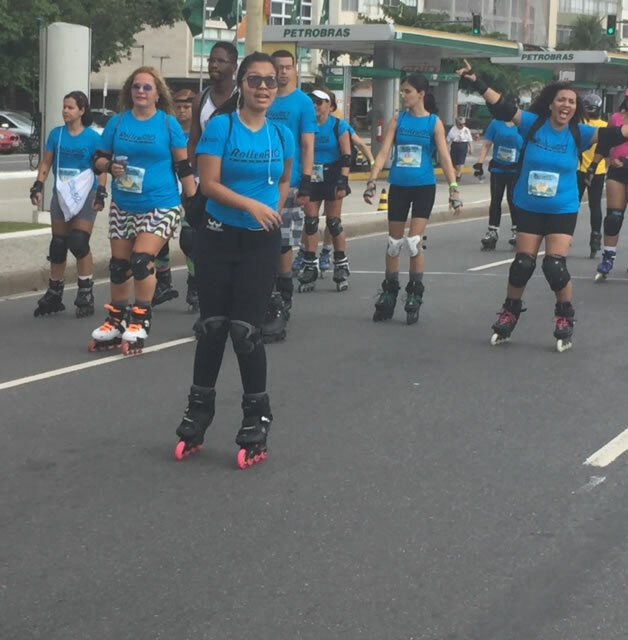 One Response to "Roller Rio 2015 event"